Visions of Jesus Christ.com - Myrrh seeping Icons Taylor, PA. Above left Image is of one of myrrh-seeping Icons Theotokos Kardiotissa ("Tender Heart") from St. George's Orthodox Church Taylor, PA. Image from [here], [here]. See large version of the Icon [here]. Right photo is the Holy Icons being venerated at St. George's Orthodox Church Taylor, PA.
[See here] brief write up on this story. Also read about healings associated with these myrrh-seeping Icons on page 5 in this [PDF]. April 3, 2019 [See here] update on “The Tender Heart” myrrh-flowing, miraculous Icon. February 12, 2012 Reported at [thetimes-tribune]. The mood was appropriately solemn, the faithful quiet and orderly in their movements. Fragrant myrrh filled the air. The encounters with the centers of attraction were quick, but the reactions were indelible. Some came away shaken and streaming tears. A few talked of a wave of peace and calm coming over them. Others described a sense of divine providence. In uncertain times, people want something, anything, to believe in. The spiritually inclined often look to the heavens for answers, and when they get what they think is a sign, they embrace it wholeheartedly. For the past 17 weeks, St. George's Orthodox Greek Catholic Church in Taylor has been hosting services centered on two icons of the Blessed Mother of the Theotokos. The faithful believe the icons seep myrrh, a heavily perfumed oil, for reasons St. George's officials are leaving unexplained. The church has sought no publicity for the services, but each week, entirely through word of mouth, standing-room-only crowds are turning up to venerate the icons. 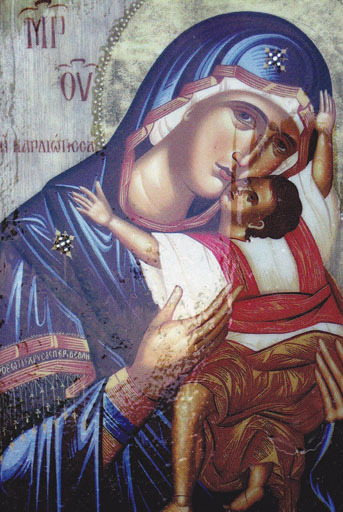 The icons reportedly came into contact with the [myrrh-streaming Iveron Icon] of the Mother of God from Hawaii, which traveled to local Orthodox churches, including St. George's, back in the fall. 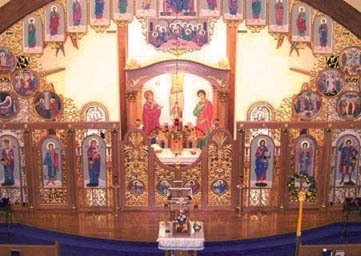 Many in the Orthodox faith believe the Iveron Icon possesses healing powers for those who pray to it.n"Miraculous icons are a normal part of orthodoxy," said Father Sergius, the abbot at the Monastery of St. Tikhon of Zadonsk in South Canaan Twp., where the Iveron Icon also made an appearance. "We have one here that weeps on and off, but it's not a constant thing." Approached at this week's service, St. George's pastor, the Very Rev. Mark Leasure, declined to comment on the icons' background, and church officials would not allow photographs to be taken. 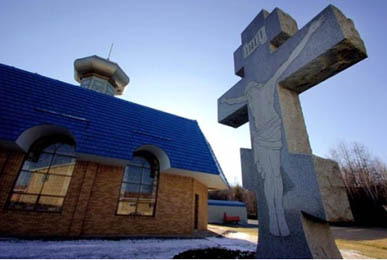 Attempts to reach officials at the Johnstown-based American Carpatho-Russian Orthodox Diocese of the U.S.A., which oversees St. George's, were unsuccessful. On a recent night, the church was packed with about 500 people. Regulars judged the attendance light compared to the previous week's service, when lines stretched out the door. The service began with about 40 minutes of prayers and hymns. The icons were brought out into the church and placed on a stand near the altar. The icons are kept in wooden cases under glass and are positioned at an incline. Cotton balls are placed at the bottom of each case to collect excess oil. "All of you are meant to be here on this night to be blessed by God," the Rev. Leasure said to the assembled moments before people started lining up. "We are blessed with something awesome." After being blessed with oil by the Rev. Leasure, each person had the chance to pray over one of the icons. Some went the extra step and kissed the glass cover. A pile of $5 and $10 bills and envelopes accumulated in the space between the icons. Indeed, the icons had myrrh on them, which was easier to see when the Rev. Leasure took them out of their enclosures and used the oil to bless attendees, adults and children. Oil seeped into the wood and smudged the glass. Some weeks there is more oil than others, regulars said. Among the crowd, the Orthodox faith was well represented, but there were plenty of people from other Christian denominations, including Roman and Byzantine Catholic. Stories circulated of attendees from previous weeks being healed of everything from serious back problems to the after-effects of stroke. As she headed to her car, a woman who refused to provide her name for publication said, "I think we're being sent a message, that it's just time to get back to God." Pittston Twp. resident Doreen Kozak attended the service with her daughter, Nicole, a sophomore at the University of Scranton. They had heard about the icons from friends. "It's something different, something amazing to see," Mrs. Kozak said. "If you believe enough, it is a miracle." Benedict Sheehan, music and choir director at St. Tikhon's, had no doubt he was witnessing a divine connection. "It's from God," said Mr. Sheehan, making his sixth appearance at the service. "It's a sign that God is real, and that the Mother of God is protecting us. I think it's a call to repentance, as well." Dunmore resident Bill Malos, there for the second time, said he didn't really care whether the oil is miraculous. What moved him most was the outpouring of people, which he called "great for Christian unity." "If nothing else, it brings people together for a prayerful time," Mr. Malos said. "It's hard to explain, but it gives me a good feeling to see this many people in church." In the Orthodox faith, icons serve as "a window into the divine," said Stevan Davies, Ph.D., professor of religious studies at Misericordia University in Dallas, "You should be looking through (the icon) to the holy person it represents. They see it as the location of holiness, something special. And life doesn't have that many special things," Dr. Davies said. "People like to have something holy in their lives, and they like to have some tangible evidence of it." Judy Soma, an East Mountain artist who paints icons, added, "People think you venerate the icon, but you don't. You venerate what the icon represents, the person it represents. 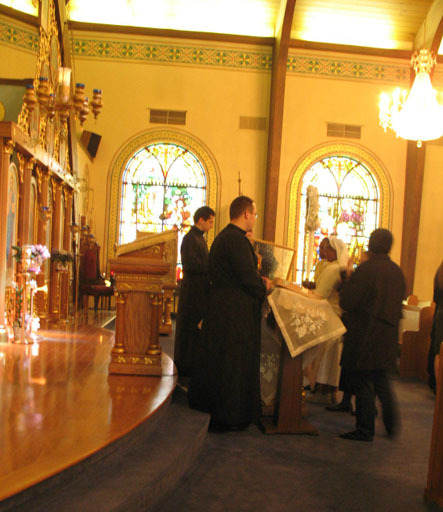 Visit St. George's Orthodox [Church] and [youtube]. [Address] 737 S. Keyser Ave, Taylor, PA 18517.